Egio. Egio is built between two rivers and is one of the most tourist cities of the Peloponnese, Greece. You'll find here beautiful beaches, lots of hotels, apartments and campsites. In Psila Alonia just outside Egio, you will find the remains of the Old Egio. Very interesting is a visit to the monastery and the Pepelinitsa Taxiarchon monastery. Not far from Egio is Eliki located, a town dating from the 4th century BC, which was destroyed by a severe earthquake. The best views you will find in the village Fteri. The view as far as Corinthian bay is amazing. 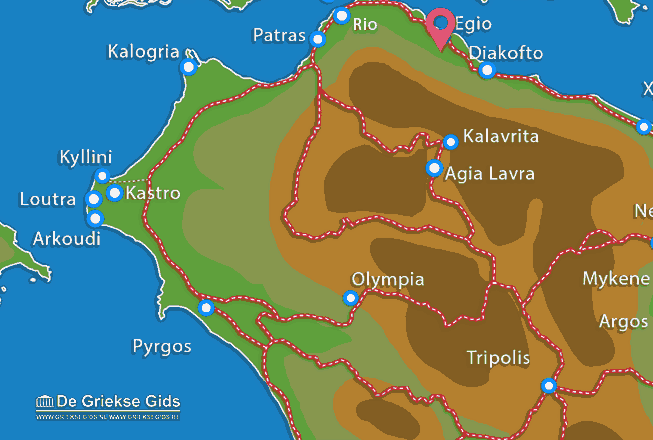 Achaia: Where on the map is Egio located?